The Barceloneta neighborhood of Barcelona, Spain is all about its connection with the sea. It's here that you'll find noisy seafood restaurants, luxurious marinas, and old fishermen's houses. Our top ten things to do in Barceloneta, Barcelona include shopping, dining, going to the aquarium, and visiting the historic sights. Roy Lichtenstein's Barcelona Head sculpture leads you into the Port Vell marina. Treats to enjoy here include an IMAX theater, a wood-paneled submarine, and the sight of hundreds of yachts and catamarans—and even the occasional warship. 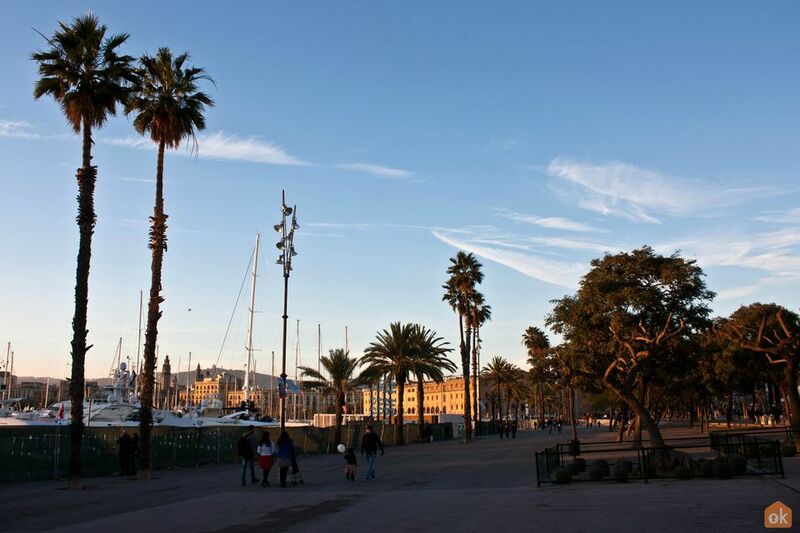 You can walk along the area between the Museum of Catalan History and the Columbus Monument and enjoy the attractions and the boats coming and going from the port. OneOcean Port Vell is touted as the marina for the superyachts. Originally built for the 1992 Olympic Games, the marina recently is a 151-berth luxury facility (the feature a spa and restaurants), for yachts up to 190 meters in length. Ciutadella is a beautiful park right in the city center. Enjoy a book in the shade of a fig tree. Row a boat in the lake. Discover the sculptures by Gaudi, Llimona, and other Catalan artists. Visit Domenech Montaner's modernist castle—the Castle of the Three Dragons—built between 1887 and 1888 as the Café-Restaurant for the World Exposition in Barcelona. Also, spelled La Xampanyeria, this is a little place where you'll find absurdly cheap bottles of Cava (Spanish sparkling wine), greasy tapas, and sandwiches. It's so crammed in the late afternoon you'll have trouble getting in. It's a great place to buy Cava too so pick up a bottle for a picnic in the park. A Port Vell warehouse has been transformed into one of Barcelona's most interesting museums, with exhibits interpreting 3,000 years of Catalan history. Go on the last Tuesday of the month (October to June) for a free guided tour. On the fourth floor of the museum is Restaurant 1881 offering both cafeteria and restaurant service with traditional Mediterranean cuisine. Enjoy the views of the Barcelona skyline as you eat. Sunday is paella day in Spain. Barceloneta is teeming with seafood restaurants, from the rather exclusive ones in front of Sant Sebastiá beach to the noisy, touristy restaurants on Joan de Borbò. If you're feeling adventurous try the black paella, which is tinted with squid ink. For the best views over Barceloneta and the port, take the cable car. It connects across the port to Montjuic. Should the views make you hungry, there's a highly-rated restaurant at the top of the tower, called La Torre de Altamar. There is another cable car, The Teleferico de Montjuïc, for people that want to travel further up the mountain after their ride on the port cable car. From the terminus, you can see a beautiful castle and more area views. Barcelona's Zoo is located in a corner of Ciutadella Park and is best accessed via its southwestern gate. It has over 400 different species on show, including hippos, tropical birds, giraffes, ant-eaters and some rather large cats. it's just 19.90€ to get in, and 11.95€ for kids. Activities include dolphin-watching, seeing the elephant training, feeding the penguins and more. Finished in 2007, this Enric Miralles-designed tower is spectacular from every angle. Also known as Mare Nostrum Tower, this architectural marvel is an office skyscraper the Ciutat Vella district. Get up close to it, and you'll see how complex, gravity-defying, and daring the design really is. It's now one of Barceloneta's main landmarks. The ultra-modern W Hotel, opened in 2009, is one of the most controversial buildings in Barceloneta. Its wave-like glass form reflects the look of the waves. Locals are not necessarily in favor of the hotel which was built too close to the sea. The 473 guest rooms and suites offer panoramic views of the Mediterranean Sea and the city of Barcelona. Dine at Chef Carlos Abellán’s restaurant, BRAVO24 or have a drink at their 26th-floor ECLIPSE rooftop bar. The aquarium of Barcelona (L'Aquàrium Barcelona) is one of the largest in Europe. Located in Port Well, you'll find more than 11,000 types of fish and sea life. There is a large oceanarium where you can get up close and personal with some sea life. If you are brave enough you can sign up for a diving session with the sharks. Kids will love to see the sharks, penguins and other sea creatures at feeding time. The market of La Barceloneta, in the historical center of the district, is a place to go for fresh seafood; deli cheeses and meats; and specialty foods like olives and oils. The market building is modern and built in a sustainable manner using solar power. The market is open Monday to Thursday from 07:00 a.m. to 2:00 p.m., Fridays from 07:00 a.m. to 08:00 p.m. and Saturdays from 07:00 p.m. to 3:00 p.m. The French train station (Estació de França), constructed in 1929, has an impressive interior loaded with marble and bronze that is worth seeing. The station has been compared with the old Gare d'Orsay in Paris. Built in the art deco style, the architectural details are stunning. The station, no longer a primary hub for train travelers, has been declared a Local Cultural Legacy by the city.